I didn’t grow these (obvs!) but they still made me inordinately happy. It’s the colours. 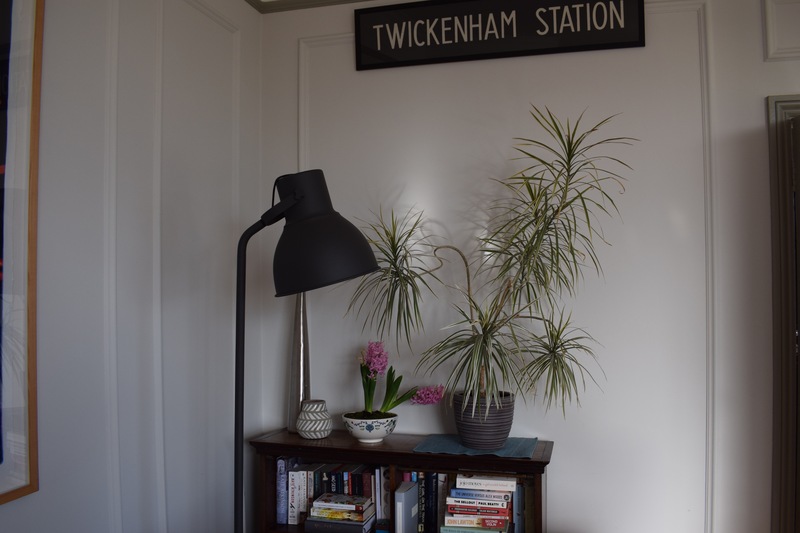 Lop-sided houseplant and listing hyacinth – a metaphor for so many things. 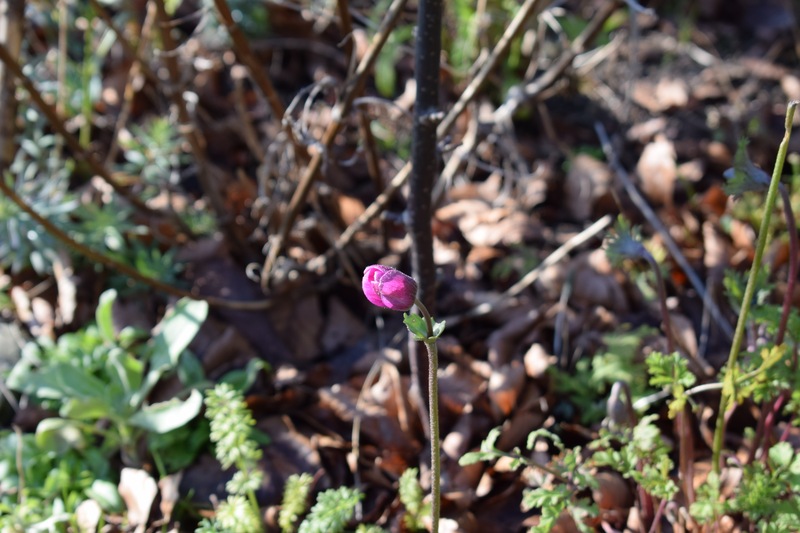 Solitary Anemone coronaria ‘Syphide’ – very exciting. Hopefully there’ll be more to come. :: The weather was glorious this weekend, teasing us with a hint of spring – warm sunshine, hardly any breeze, tweeting birds, calm glistening sea… It was blissful and motivated me to actually clean a few windows. (I know! Only on the inside, mind.) I thoroughly spring-cleaned the kitchen, scrubbing all the ledges, shelves and surfaces, putting stuff away, even cleaning the cooker hood grills in the dishwasher. It was all sparkling for about half an hour before everyone came to have a look and mess it up again. :: On Sunday, we finally got round to pruning the apple and pear trees we planted last spring. It felt a little like vandalism, slicing off branches covered in fat buds, but I know it will lead to stronger, better fruiting trees. I brought all the fruity wands indoors and stuck them in a couple of vases of water. Hopefully they’ll come into leaf and possibly even blossom. You never know. :: The balmy weekend weather brought out the wildlife. 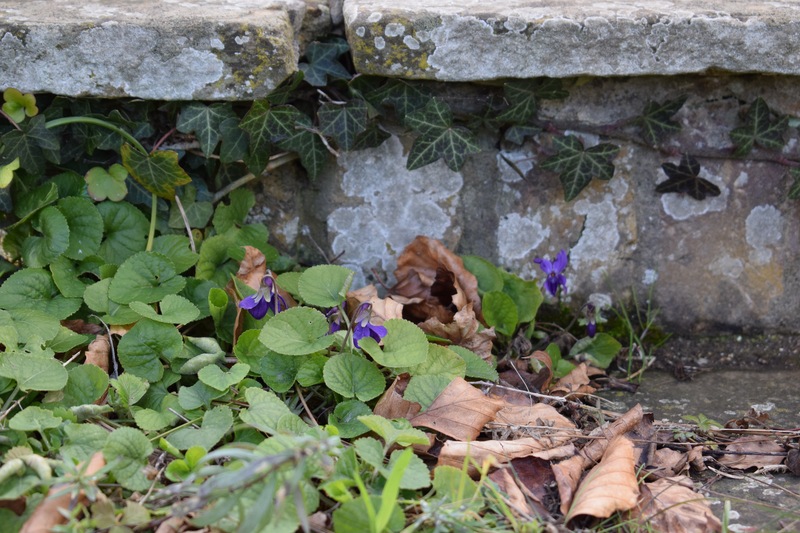 I saw my first butterfly of the year on Saturday – a pristine primrose-yellow brimstone energetically fluttering along the hedgerow. It wouldn’t stay still long enough for me to take a photo, unfortunately. 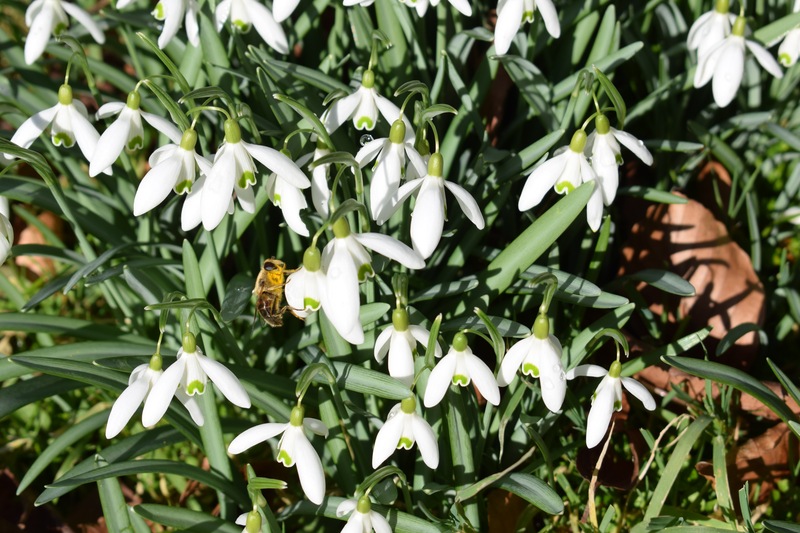 But the bees on the snowdrops did; they were lazily buzzing about in the sunshine (see photos above). It’s been foul weather for the past couple of days, though, and I’ve been worrying about all those insects who were out and about. How will they survive? Hopefully, they’ve found cosy crevices to shelter in. The weatherman told of icy blasts coming from the Arctic later in the week. Winter is not over yet. :: We’ve been planning our summer holiday. The boys will have both finished major exams and will need a break (as will we all), so we’re heading off for two weeks to the beautiful island of Mallorca. We had a few happy holidays there when the children were small and they’re excited to be going back. I’m excited, too, and hope it will live up to our memories. To be honest, I’ll be happy just to lie by a pool and read for as long as possible. :: My parenting skills have been sorely stretched lately. Is the first child always the test one? The one we make mistakes over and possibly mess up, like the first pancake? (That’s probably not the best analogy…) If anyone tells you that parenting gets easier as children get older, give them a wary look – I’ve been at this game for 18 years and three months and I’m often none the wiser. If anyone has any magic tips for keeping a boy going to the final highest hurdle in this gruelling long-distance race called school, I’d be grateful. You are sooooo right that parenting doesn’t get easier as they get older. I will say, though, that going off to university made a huge difference in our son (the only one of our three who sorely tested our patience in his younger years). I’m sure he’d been suffering from “REEEALLLY wanting to leave home and yet REEEEEALLLLY being scared of actually leaving” syndrome. Within a couple of months of him starting university I could tell that it had finally hit him how great it is to have people behind you who love you like crazy and will do anything to support you. And the first time he came home for a visit, he was a delight and offered to chores the whole weekend. There is hope!! I love your pancake analogy (I’m an eldest child). The weekend sun was glorious and prompted a big window clean here, though mainly because the windows looked so dirty with the sun streaming through them.I fear we’re in for a cold chill that will be a little hard to bear after that sunshine. 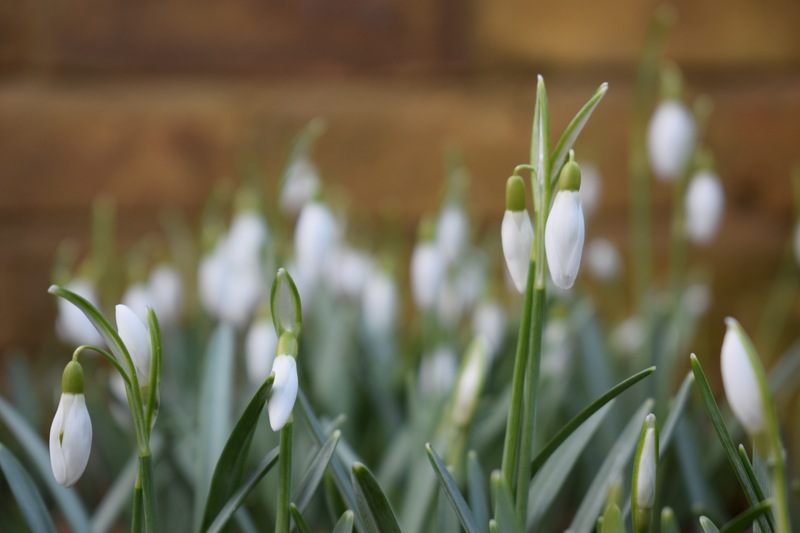 Beatiful snowdrops. I think the eldest child is no problem, it’s the others that cause the problems!! I know it can sometimes be difficult, do try to enjoy all periods of child raising, they will soon be spreading their wings. Can’t help with the parenting question, Sam, as mine were both girls and it wasn’t an issue although Younger Daughter was a good deal less enthusiastic about school than her sister 😉 Good to see signs of spring in your garden, especially the solitary Sylphide, something i struggle to grow. Your non-home-grown blooms are such beautiful jewel like colours, aren’t they? No, it’s not always the firstborn. I never had any trouble with my eldest (and in fact have just got home from Manchester where I was in the audience of University Challenge – she was magnificent – one of the proudest days of my life). I’m equally proud of my two younger children – twins – of whom one has been…. difficult as a teenager, admittedly during a searingly ghastly divorce. It is perhaps not a coincidence that the journal I kept throughout my days as a stay at home mum records my saying of her when she was little ‘the only reason I worry about (X) is that I don’t worry about her’. Hmm. I wish I could offer the requested advice but I’m afraid I have none. But I will as the Germans say hold my thumbs for you. I don’t think parenting gets easier, I do think we sometimes relax more because we realize how limited our control is over how things turn out. 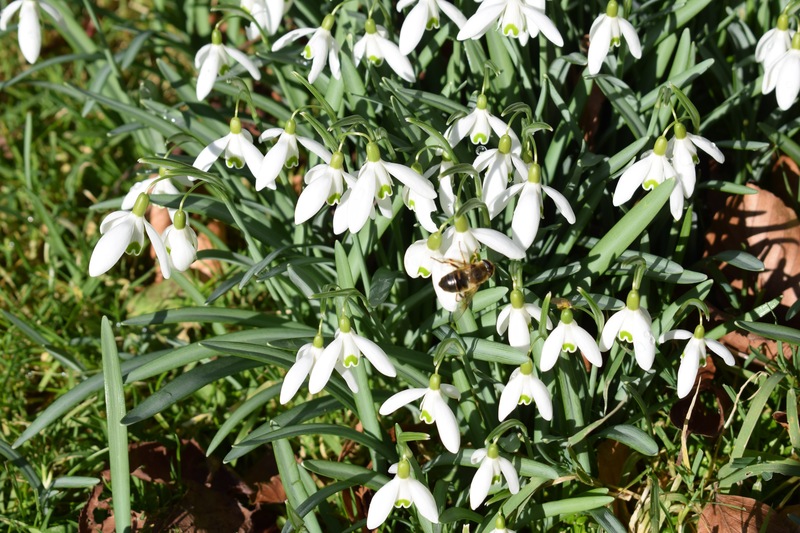 Loving your snowdrops! We actually have one small patch that is about to bloom. 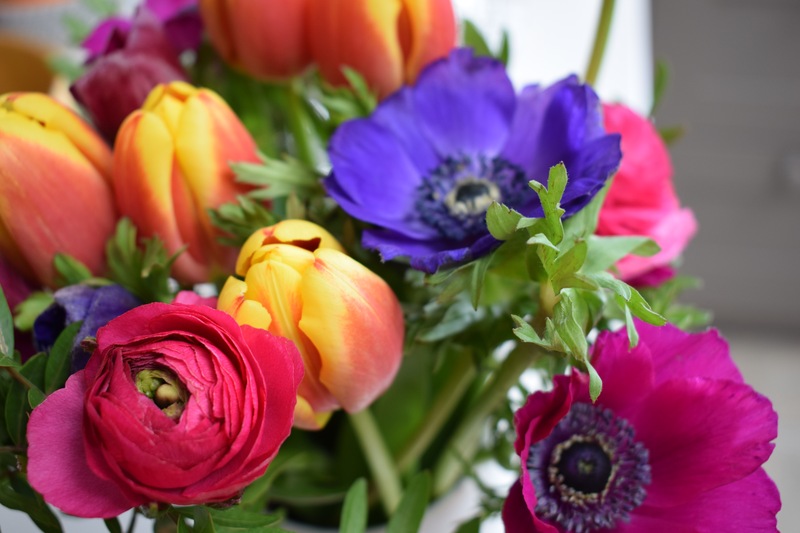 Those anemones and ranunculus are gorgeous! Yes, the first child does often seem to be the test-pilot, poor thing! I’m sure you are doing a better job than you think, though. That you are aware of the pressures on him is a good indication.